This disease may result in sudden cardiac death in young people, and the assessment of patients who present with dysrhythmias or syncope should prompt a review of the ECG for suggestive features of Arrhythmogenic Right Ventricular Cardiomyopathy/Dysplasia (as well as ischaemia, conduction deficits, WPW syndrome, Brugada syndrome, and prolonged QT interval). It is said that when using crystalloids, two to four times more fluid may be required to restore and maintain intravascular fluid volume compared with colloids, although true evidence is scarce. The ratio in the SAFE study comparing albumin with saline resuscitation was 1:1.3, however. A single-centre, single- blinded, randomized clinical trial was carried out on 24 critically ill sepsis and 24 non-sepsis patients with clinical hypovolaemia, assigned to loading with normal saline, gelatin 4%, hydroxyethyl starch 6% or albumin 5% in a 90-min (delta) central venous pressure (CVP)-guided fluid loading protocol. Haemodynamic monitoring using transpulmonary thermodilution was done each 30 min to measure, among other things, global end-diastolic volume and cardiac indices (GEDVI, CI). The reason sepsis was looked at was because of a suggestion in the SAFE study of benefit from albumin in the pre-defined sepsis subgroup. Independent of underlying disease, CVP and GEDVI increased more after colloid than saline loading (P = 0.018), so that CI increased by about 2% after saline and 12% after colloid loading (P = 0.029). Their results agree with the traditional (pre-SAFE) idea of ratios of crystalloid:colloid, since the difference in cardiac output increase multiplied by the difference in volume infused was three for colloids versus saline. Take home message? Even though an outcome benefit has not yet been conclusively demonstrated, colloids such as albumin increase pre-load and cardiac index more effectively than equivalent volumes of crystalloid in hypovolaemic critically ill patients. Symptomatic cerebral vasospasm occurs in nearly one-third of patients with aneurysmal subarachnoid hemorrhage and is a major cause of disability and mortality in this population. Magnesium (Mg) acts as a cerebral vasodilator by blocking the voltage-dependent calcium channels.. Experimental studies suggest that Mg also inhibits glutamate release by blocking N-methyl-D-aspartate receptors, decreases intracellular calcium influx, and increases red blood cell deformability; all these changes may reduce the occurrence of cerebral vasospasm and minimise brain ischemic injury occurring after SAH. One hundred and ten patients within 96 hours of admission for aneurysmal subarachnoid haemorrhage (SAH) were randomised to receive iv magnesium or placebo. Nimodipine was not routinely given. Twelve patients (22%) in the magnesium group and 27 patients (51%) in the control group had delayed ischemic infarction – the primary endpoint (p< .0020; odds ratio [OR], 0.28; 95% confidence interval [CI], 0.12– 0.64). Mortality was lower and neurological outcome better in the magnesium group but these results were not statistically significant. Larger trials of magnesium in SAH are ongoing. A multicentre RCT showed intravenous magnesium sulphate does not improve clinical outcome after aneurysmal subarachnoid haemorrhage, therefore routine administration of magnesium cannot be recommended. Background Magnesium sulphate is a neuroprotective agent that might improve outcome after aneurysmal subarachnoid haemorrhage by reducing the occurrence or improving the outcome of delayed cerebral ischaemia. We did a trial to test whether magnesium therapy improves outcome after aneurysmal subarachnoid haemorrhage. Methods We did this phase 3 randomised, placebo-controlled trial in eight centres in Europe and South America. We randomly assigned (with computer-generated random numbers, with permuted blocks of four, stratified by centre) patients aged 18 years or older with an aneurysmal pattern of subarachnoid haemorrhage on brain imaging who were admitted to hospital within 4 days of haemorrhage, to receive intravenous magnesium sulphate, 64 mmol/day, or placebo. We excluded patients with renal failure or bodyweight lower than 50 kg. Patients, treating physicians, and investigators assessing outcomes and analysing data were masked to the allocation. The primary outcome was poor outcome—defined as a score of 4–5 on the modified Rankin Scale—3 months after subarachnoid haemorrhage, or death. We analysed results by intention to treat. We also updated a previous meta-analysis of trials of magnesium treatment for aneurysmal subarachnoid haemorrhage. This study is registered with controlled-trials.com (ISRCTN 68742385) and the EU Clinical Trials Register (EudraCT 2006-003523-36). Findings 1204 patients were enrolled, one of whom had his treatment allocation lost. 606 patients were assigned to the magnesium group (two lost to follow-up), 597 to the placebo (one lost to follow-up). 158 patients (26·2%) had poor outcome in the magnesium group compared with 151 (25·3%) in the placebo group (risk ratio [RR] 1·03, 95% CI 0·85–1·25). Our updated meta-analysis of seven randomised trials involving 2047 patients shows that magnesium is not superior to placebo for reduction of poor outcome after aneurysmal subarachnoid haemorrhage (RR 0·96, 95% CI 0·86–1·08). Interpretation Intravenous magnesium sulphate does not improve clinical outcome after aneurysmal subarachnoid haemorrhage, therefore routine administration of magnesium cannot be recommended. A review article in Anesthesia and Analgesia provides a summary of the literature surrounding RSI controversies. Should a pre-determined dose of induction drug be given or should it be titrated to effect prior to giving suxamethonium? Should fast acting opioids be coadministered to blunt the pressor response? What is the optimal dose of suxamethonium? Should defasciculating doses of neuromuscular blocking drugs be given? What is the ‘priming’ technique with rocuronium and is it necessary? Is it really bad to bag-mask ventilate the patient after induction prior to intubation? Which patients might this benefit? Should patients with full stomachs be anaesthetised sitting up, supine, or head down? Is cricoid pressure a good or a bad thing? Not surprisingly the jury is still out on these, which is of course why they remain ‘controversies’. The review article provides a readable, interesting, and up to date summary of the evidence to date. A case is reported of a stroke patient who aspirated his nasopharyngeal airway, resulting in coughing and desaturation. After iv propofol and topical anaesthesia to the oropharynx and hypopharynx, it was seen on laryngoscopy to be within the trachea but could not be retrieved with Magill forceps. Instead, his doctors inserted a well lubricated 14 Fr foley catheter through the lumen of the tube, inflated the balloon, and pulled it out. 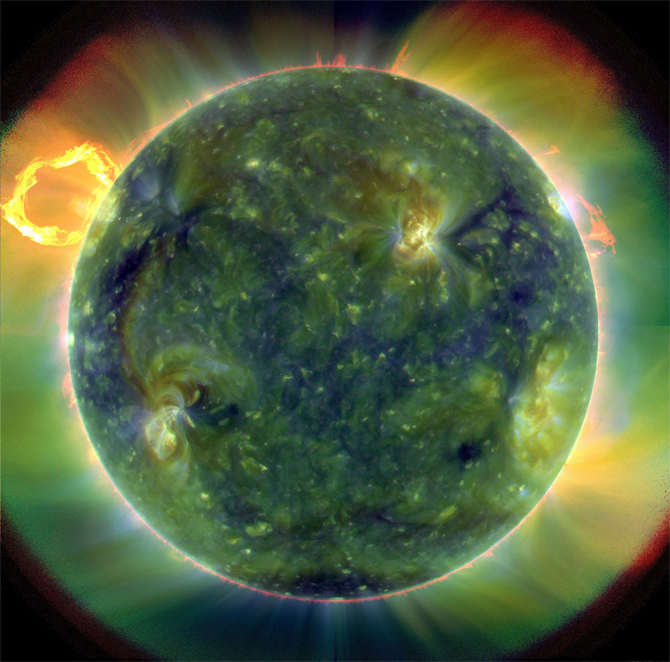 Launched on Feb. 11, 2010, SDO will provide images with clarity 10 times better than high-definition television. SDO will send 1.5 terabytes of data back to Earth each day, which is equivalent to a daily download of half a million songs onto an MP3 player. While clearing up after teaching with my bald colleague Dr Phil Hyde yesterday I noticed his bulging scalp veins and this reminded me that we don’t talk about this route much in our Paediatric Emergency Medicine Course. An alternative route for rehydration (e.g. intraosseous infusion) should be considered initially, rather than risk multiple, unsuccessful attempts at scalp vein cannulation. We recommend that the time elapsed between injury and operation be minimised for patients in need of urgent surgical bleeding control. (Grade 1A). We recommend adjunct tourniquet use to stop life-threatening bleeding from open extremity injuries in the pre-surgical setting. (Grade 1C). We recommend that the physician clinically assess the extent of traumatic haemorrhage using a combination of mechanism of injury, patient physiology, anatomical injury pattern and the patient’s response to initial resuscitation. (Grade 1C). We recommend initial normoventilation of trauma patients if there are no signs of imminent cerebral herniation. (Grade 1C). We recommend that patients presenting with haemorrhagic shock and an identified source of bleeding undergo an immediate bleeding control procedure unless initial resuscitation measures are successful. (Grade 1B). We recommend that patients presenting with haemorrhagic shock and an unidentified source of bleeding undergo immediate further investigation. (Grade 1B). We recommend early imaging (FAST or CT) for the detection of free fluid in patients with suspected torso trauma. (Grade 1B). We recommend that patients with significant free intraabdominal fluid and haemodynamic instability undergo urgent intervention. (Grade 1A). We recommend further assessment using computed tomography for haemodynamically stable patients who are either suspected of having torso bleeding or have a high risk mechanism of injury. (Grade 1B). We do not recommend the use of single haematocrit measurements as an isolated laboratory marker for bleeding. (Grade 1B). We recommend both serum lactate and base deficit measurements as sensitive tests to estimate and monitor the extent of bleeding and shock. (Grade 1B). We recommend that routine practice to detect post-traumatic coagulopathy include the measurement of international normalised ratio (INR), activated partial thromboplastin time (APTT), fibrinogen and platelets. INR and APTT alone should not be used to guide haemostatic therapy. (Grade 1C) We suggest that thrombelastometry also be performed to assist in characterising the coagulopathy and in guiding haemostatic therapy. (Grade 2C). We recommend that patients with pelvic ring disruption in haemorrhagic shock undergo immediate pelvic ring closure and stabilisation. (Grade 1B). We recommend that patients with ongoing haemodynamic instability despite adequate pelvic ring stabilisation receive early preperitoneal packing, angiographic embolisation and/or surgical bleeding control. (Grade 1B). We recommend that early bleeding control of the abdomen be achieved using packing, direct surgical bleeding control and the use of local haemostatic procedures. In the exsanguinating patient, aortic cross-clamping may be employed as an adjunct. (Grade 1C). We recommend that damage control surgery be employed in the severely injured patient presenting with deep hemorrhagic shock, signs of ongoing bleeding and coagulopathy. Additional factors that should trigger a damage control approach are hypothermia, acidosis, inaccessible major anatomic injury, a need for time-consuming procedures or concomitant major injury outside the abdomen. (Grade 1C). We recommend the use of topical haemostatic agents in combination with other surgical measures or with packing for venous or moderate arterial bleeding associated with parenchymal injuries. (Grade 1B). We recommend a target systolic blood pressure of 80-100 mmHg until major bleeding has been stopped in the initial phase following trauma without brain injury. (Grade 1C). We recommend that crystalloids be applied initially to treat the bleeding trauma patient. (Grade 1B) We suggest that hypertonic solutions also be considered during initial treatment. (Grade 2B) We suggest that the addition of colloids be considered within the prescribed limits for each solution in haemodynamically unstable patients. (Grade 2C). We recommend early application of measures to reduce heat loss and warm the hypothermic patient in order to achieve and maintain normothermia. (Grade 1C). We recommend a target haemoglobin (Hb) of 7-9 g/dl. (Grade 1C). We recommend that monitoring and measures to support coagulation be initiated as early as possible. (Grade 1C). We recommend that ionised calcium levels be monitored during massive transfusion. (Grade 1C) We suggest that calcium chloride be administered during massive transfusion if ionised calcium levels are low or electrocardiographic changes suggest hypocalcaemia. (Grade 2C). We recommend early treatment with thawed fresh frozen plasma in patients with massive bleeding. (Grade 1B) The initial recommended dose is 10-15 ml/kg. Further doses will depend on coagulation monitoring and the amount of other blood products administered. (Grade 1C). We recommend that platelets be administered to maintain a platelet count above 50 × 109/l. (Grade 1C) We suggest maintenance of a platelet count above 100 × 109/l in patients with multiple trauma who are severely bleeding or have traumatic brain injury. (Grade 2C) We suggest an initial dose of 4-8 platelet concentrates or one aphaeresis pack. (Grade 2C). We recommend treatment with fibrinogen concentrate or cryoprecipitate if significant bleeding is accompanied by thrombelastometric signs of a functional fibrinogen deficit or a plasma fibrinogen level of less than 1.5-2.0 g/l. (Grade 1C) We suggest an initial fibrinogen concentrate dose of 3- 4 g or 50 mg/kg of cryoprecipitate, which is approximately equivalent to 15-20 units in a 70 kg adult. Repeat doses may be guided by thrombelastometric monitoring and laboratory assessment of fibrinogen levels. (Grade 2C). We suggest that antifibrinolytic agents be considered in the bleeding trauma patient. (Grade 2C) We recommend monitoring of fibrinolysis in all patients and administration of antifibrinolytic agents in patients with established hyperfibrinolysis. (Grade 1B) Suggested dosages are tranexamic acid 10-15 mg/kg followed by an infusion of 1-5 mg/kg per hour or ε-aminocaproic acid 100-150 mg/kg followed by 15 mg/kg/h. Antifibrinolytic therapy should be guided by thrombelastometric monitoring if possible and stopped once bleeding has been adequately controlled. (Grade 2C). We suggest that the use of recombinant recombinant activated coagulation factor VII (rFVIIa) be considered if major bleeding in blunt trauma persists despite standard attempts to control bleeding and best-practice use of blood components. (Grade 2C). We recommend the use of prothrombin complex concentrate for the emergency reversal of vitamin K-dependent oral anticoagulants. (Grade 1B). We do not suggest that desmopressin (DDAVP) be used routinely in the bleeding trauma patient. (Grade 2C) We suggest that desmopressin be considered in refractory microvascular bleeding if the patient has been treated with platelet-inhibiting drugs such as aspirin. (Grade 2C). We do not recommend the use of antithrombin concentrates in the treatment of the bleeding trauma patient. (Grade 1C).